A restaurant in the province of Cuenca (Spain), the Posada Real has won first prize in the International Paella Valenciana contest held last weekend in the Valencian town of Sueca. Picanterra House Restaurant , Cullera (Valencia ) got the second position. Each of the participants prepared a 15-serving paella following the original valencian recipe put together by the organizing committee and endorsed by the Club Chefs of Valencia: rice , olive oil , chicken , rabbit , snails , dry beans , green beans , white beans , ripe tomato, saffron, paprika , salt and water . The jury , composed of experts of gastronomy, paellas praised by various criteria such as cooking point , taste , color , symmetry of the ingredients and socarrat, rice crisp, point . Sueca is considered the most important rice-growing town in Spain , with more than 5,000 cultivated hectares of rice every year. 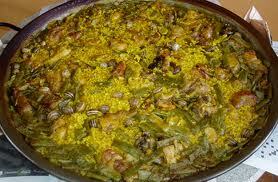 So next time your travel to Miami, make room not only for cuban specialities but for paella too. Posted on September 17, 2013, in Eateries. Bookmark the permalink. 1 Comment.